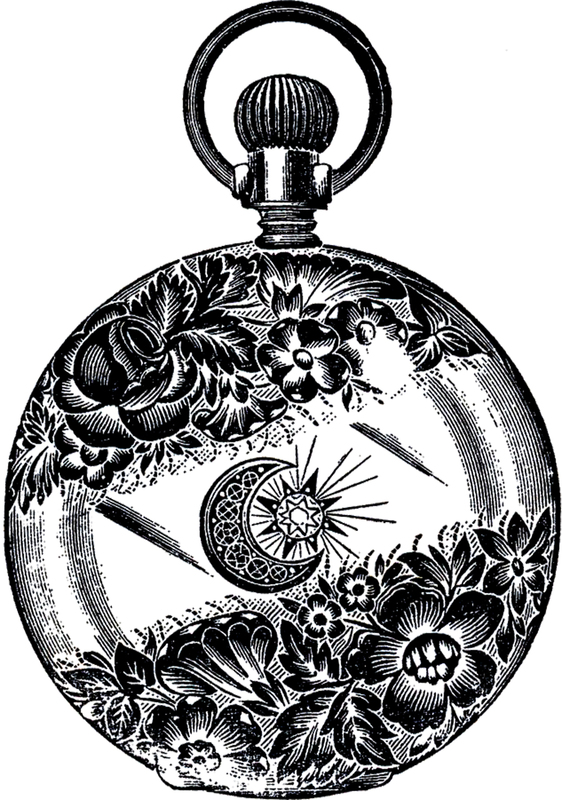 Public Domain Pocket Watch Image – Fancy! This is a Public Domain Pocket Watch Image! This illustration was scanned from an Antique Jewelry Catalog. Shown above is a fancy looking Pocket Watch with a Crescent Moon and a Diamond Star on it. A Nice Old Graphic for your Vintage or Steampunk Projects! Fancy Flying Fish Images! Public Domain Patriotic Label Vintage Graduation Boy Image – Potteresque! « Christmas Holly Girl Image – So Beautiful!! How unusual and pretty! Thank you! Karen, I made a mistake. I signed up for your email notices (so glad you offer it), then confirmed it and got the page with the gifts. After downloading the first one, I automatically closed that window, forgetting there were more below. Now I don’t seem to be able to get back to the images to get the others. Any chance you get get me back there? So sorry. Just send me an email at karen(at)thegraphicsfairy(dot)com and I’ll email you a new link for the download! Found some great clock burlap at Hobby Lobby so will make 3 frames with 3 clocks to put on burlap then frame. Thank you so much, these are awesome for new art on gallery wall or wherever it feels right to hang at the moment. I get tired of things in same places so like to change art and furniture around on impulse. That sounds like a wonderful project JaneEllen! A nice way to add some new life to a room!